A Texas county commissioner has apologised for criticising a local judge who spoke in Spanish during a news conference. Commissioner Mark Tice faced a swift backlash for saying Judge Lina Hidalgo was a "joke" for not speaking English when answering questions. Judge Hidalgo had in fact been speaking and translating between both languages. On Tuesday, Mr Tice said he "regretted" his words, and apologised to the judge and Hispanic community. Judge Hidalgo is an elected official in Harris County - home to the city of Houston - where 43% of the 4.6 million residents are Hispanic or Latino, according to US Census Bureau data. She is the first Latina and first woman to be elected as the county's top official, US media reported. The judge had been relaying updates about a chemical fire cleanup that was broadcast live on Facebook, answering reporter's questions in Spanish and English. At one point during the livestream, when the judge was speaking in Spanish, Mr Tice commented: "She is a joke. English this is not Mexico." He later reiterated the sentiment to the Houston Chronicle. "It's real simple," he said. "This is the United States. Speak English." Following the widespread condemnation of his remarks, Mr Tice clarified and apologised for his emotional response, saying he thought there had been no English translation given to the Spanish questions. "If that is not the case, then I sincerely apologise," he wrote on Facebook. "I recognise how my response could have been interpreted in a derogatory manner and for that I am sorry." 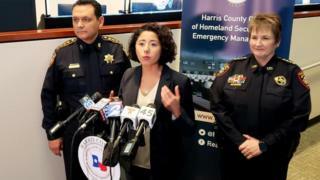 Judge Hidalgo's director of communications, Kiran Khalid, told the Chronicle the judge "represents all of Harris County and given the county's composition and her bilingual skills, she will continue to communicate as broadly as possible especially when public safety is at stake". The incident is one of many cases of Spanish speakers being challenged for not using English in America. In February, the American Civil Liberties Union filed a lawsuit against US Customs and Border Protection for detaining two women after an agent heard them speaking Spanish in a grocery store.